Publisher: Mauve Square Publishing, 2012. 234 pages. This is such a great series! The adventure ramps up right from the start, and doesn't quit. It helps that this time, the kids know what's happening, and what to expect (they learned fast from their first adventure!). There's no time lost in trying to figure out what's happening. It's also nice that Max can communicate. I love his outsized ego and decidedly cat-like personality. Max may be one of the great cats of literature. The author does an amazing job of balancing the scary aspects of the story--there are real threats to the children--with a level of humor that keeps it "safe" for younger readers (Max is a big help here). Leighton-Porter also makes good use of the myths that are out there for the reading, not changing "history," but filling in some of the, er, shadows around them. In particular, she gives personality to the mythical characters [minor spoilers! ], so that we find that Theseus is a bit of a jerk, and Ariadne, to my delight, is shocked out of her infatuation with a little help from Jemima, and her ending may not be quite what the more ancient sources thought. Nice to introduce a little feminism to the early civilizations! I greatly enjoyed the first book in the series, and I think this one might be even better. I have #3 queued up and look forward to continuing the series--I think there are 8 books, and since this is one of my choices for the GMGR "Finish the Series" challenge, I have a lot of reading to do! Note: Wendy Leighton-Porter has a story in the BookElves Anthology, as do I. This association may have influenced my decision to start reading the series, but it did not influence my review, and the decision to continue with the series is purely the result of a great reading experience. This is a great series for readers 8-12. A bit of exposure to mythology, in the wrapping of an exciting adventure with a touch of humor. What more could you want? 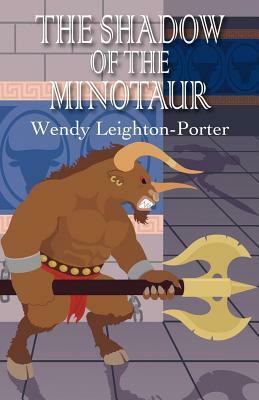 FTC Disclosure: I purchased The Shadow of the Minotaur, and received nothing from the writer or publisher for my honest review. The opinions expressed are my own and those of no one else. I am disclosing this in accordance with the Federal Trade Commission's 16 CFR, Part 255: "Guides Concerning the Use of Endorsements and Testimonials in Advertising." Good review... especially "Max may be one of the great cats of literature." He was larger than life (and he was a big boy! ), just like Fred and George. :D I do love Max. Of course, I'm a sucker for cats, with all their beautiful self-centeredness along with the utterly soothing effects of their soft fur and the purr. (I am also terribly allergic, and that doesn't stop me petting kitties. I just wash up very thoroughly immediately after). You had me at "unusual talking cat." Adding this to my to read list even though I am ever so much more than 12.